Got ape? 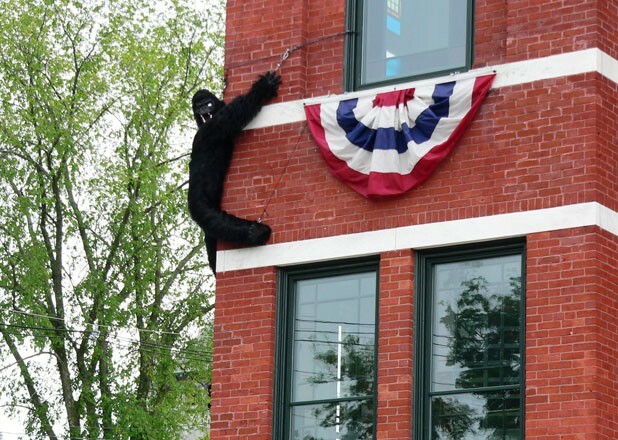 Middlebury’s Town Hall Theater does: King Kong, climbing up the side of its building. Actually, make that King Kong Jr. — he’s a miniature of the behemoth from Skull Island — and he’s not scaling the building so much as tethered there. But whatever. This gorilla is the mascot, you might say, of a clever marketing campaign for THT’s 2009-10 membership drive. And he does look ferocious, in a cuddly sort of way. With the slogan “Be Part of Something Big,” the restored venue’s officials aim to “scare up” 500 memberships this summer. THT executive director Doug Anderson says that about 100 have pitched in already, perhaps inspired by Kong’s appearance in Middlebury’s Memorial Day parade. Anderson dressed as an old-time movie director, he says, while some anonymous dude got to sweat inside an ape suit. This drive does include a mailer, but it easily stands out from those in plain envelopes. Middlebury graphic designer Jory Raphael of Sensible World created a dramatic collectible piece in the style of a classic movie poster, showing Kong perched on the Town Hall Theater. And, by the way, Kong will scale the tower as donations roll in — call him a gorilla thermometer. With any luck, he’ll make it to the target “500” number posted at the top. The admission is a Depression-era throwback, too: 25 cents. But that’s a bennie for the theatergoing public. Anderson is hoping folks will turn into donors at $50 to $5000 a pop. “We wouldn’t mind if someone gave more,” he clarifies. “Theater organizations are always looking for that one big underwriter.” Of course, there are perks at each level of giving. At $1000, for example, “You can come to a quarterly preview cocktail party where I talk about what’s going to happen [at the theater], and the performers are there,” Anderson explains. If the theater’s first year in business is any indication, that list of coming attractions will be long. The venue has hosted 43 performances, 16 concerts, six dances, five gallery openings, 15 Middlebury College events, nine Metropolitan Opera in HD events, and much more since officially opening some 12 months ago. “Attendance at all of our events has been phenomenal,” Anderson boasts. The nine-year physical restoration of THT (originally constructed in 1884) indicates how the community has rallied for culture. The place is the centerpiece of an artistic renaissance that includes several new galleries in town. To that point, the brand-new Middlebury Studio School is holding a fundraiser this Saturday, too, in the former Frog Hollow pottery studio. Ceramic works by students, instructors and local artists will be for sale all day, along with garage-sale items. Across the street, Anderson hopes, King Kong will be climbing the walls. Climbing the walls to take part? Middlebury Town Hall Theater screens King Kong on Saturday, June 20, at 2 and 8 p.m. Tickets available at the door or by calling 382-9222. For information about the fundraising drive, or to obtain the King Kong poster, call 388-1436. The Middlebury Studio School fundraiser/sale also takes place Saturday, June 20, from 10 a.m. to 4 p.m., at 1 Mill Street. Info, 247-3702.